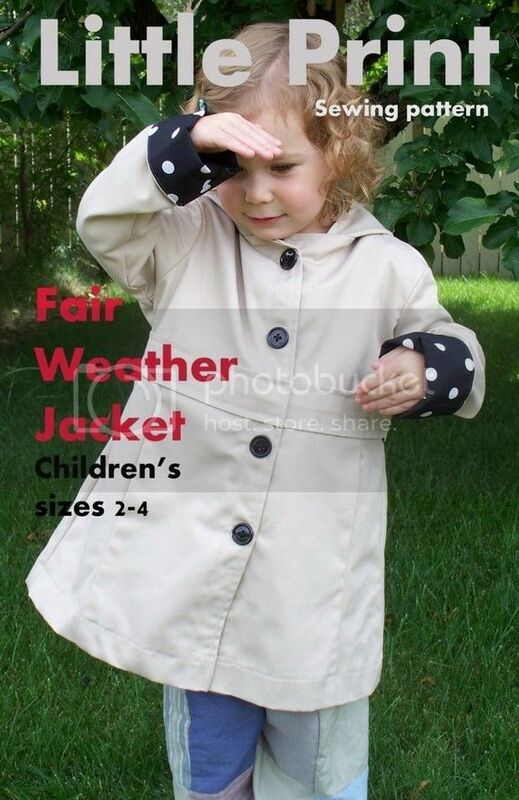 I FINALLY created a PDF version of the Fair Weather Jacket sewing pattern in children's sizes 5-8. It is available in my shop now, but before you hop over there, I thought I would offer up a free copy to two readers here on IndieTutes. 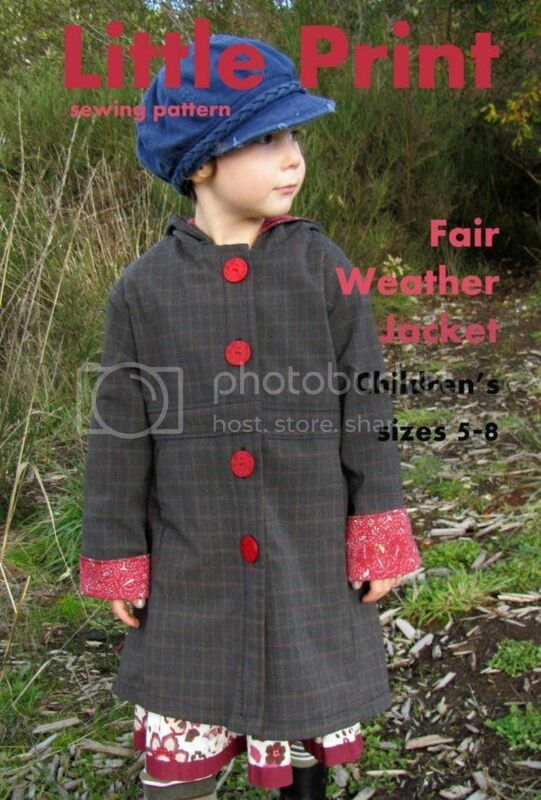 To enter to win a free copy of the Fair Weather Jacket ePattern (pdf) in sizes 5-8, please leave a comment below. I will randomly select two commenters this evening, after the kids are in bed, approximately 9:30pm mst. 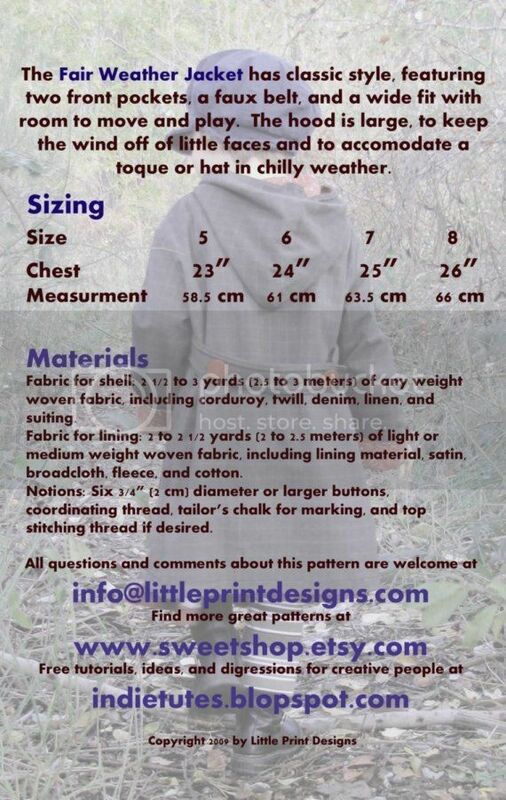 If you would rather have a copy of the sewing pattern in children's sizes 2-4, please state so in you comment. It is the same jacket pattern, just for smaller people. You can always visit my shop for more sewing ePatterns for children. I send them typically within a few hours of purchase and definitely within 24 hours. If you are feeling nervous about trying ePatterns for the first time, there are several patterns available on IndieTutes for free, where you can check out how to print and assemble and ePattern at your leisure. Try the Solar Dress ePattern to become aquianted with downloading and reassembling pattern pieces. I am always here for questions and comments, just email me at vegbee@littleprintdesigns.com or info@littleprintdesigns.com. Thank you everyone for stopping by and entering the giveaway. It really is a beautiful jacket, I would love to win the pattern! I've been meaning to venture into jacket making for a while now! I love this jacket! Glad to see the larger sizes! I would definitively try this pattern, in smaller size (2-4 years old). It's gorgeous!!! Happy new year! I would love to win a copy of your beautiful jacket! Neat pattern! I would love to win the larger size one! I would love a copy. I have 3 kids that I could make this for. Well done for getting these patterns out there, something like this would take me years. I would love a copy, especially because you Oh wise one, did make it. So cute! I would love to make one for my girl. *raising hand* Please?!?! Would love to make one! me me me! in either size! I would love to try the pattern. My girls love hoods on their jackets! I'd love to make one for my munchkin! Please enter me in for the smaller size! Thanks! Congratulations on the new pattern & happy new year! Hope your 2012 is fabulous. Looks great. I used your blog a lot as I was learning to sew. Thanks for all your help! Love It and would love to make it. Love it - might even get it finished for winter here... If I start right away! I love this jacket design. And I'd love to win the ePattern! Gorgeous cost. I'd love to try it in a 2-4 size. Awesome! I love e-patterns. It's great setting the Ipad onmy seeing table instead of sorting through paper sheets. Thanks you for te giveaway. I'd love to make one o these jackets for my son. I'd love a copy of the pdf pattern! Thanks for the chance, and good luck with your new line of patterns! Thanks for a chance to win one! Love the jacket, but would need size 2-4 for my little one. Thanks for the opportunity to win a copy of your newest pattern. With 5 grand kids between 5 years old and 1 month old (3 girls and 2 boys) I could really get a lot of use from this pattern should i be lucky enough to be one of the winners! What a great looking jacket! I'd adore making one for my daughter. Thanks for the chance to win! I'd love a copy. Your preschool pants pattern is my favorite most used pattern! I love this jacket. Thanks for the chance to win. Oh how cute! Happy New Year. I would love to win this pattern! If I don't win it I may just buy it; I'm so glad to see your store is open again! I'd be interested in the smaller size as I understand the coats have quite a bit of ease? Thank you so much for your blog. I've followed you quite a long time now and I think you are simply awesome! Yay! I like the fuzzy one in the picture! Oh, I love that jacket! I wish it came in adult sizes, but I'll settle for making a few for the kidlets in my life. Happy New Year! is it too late??? this would be a perfect first project for 2012! Oh, I hope I got this in on time!! :) Love your patterns! Oooh Oooh Oooh! I LOVE this jacket! My little girl would love me to make one for her. I have always loved this pattern, so elegant and cute. that is a fantastic coat!!! happy new year to you too. Wow, this looks great. The bigger the better! Hi I no longer have little people to sew for but a friend has been learning how to sew and I just know she would think this was perfect for her little girl. pattern in the smaller size please. I love the jacket in the bigger sizes. It will make my daughter even beautifully. 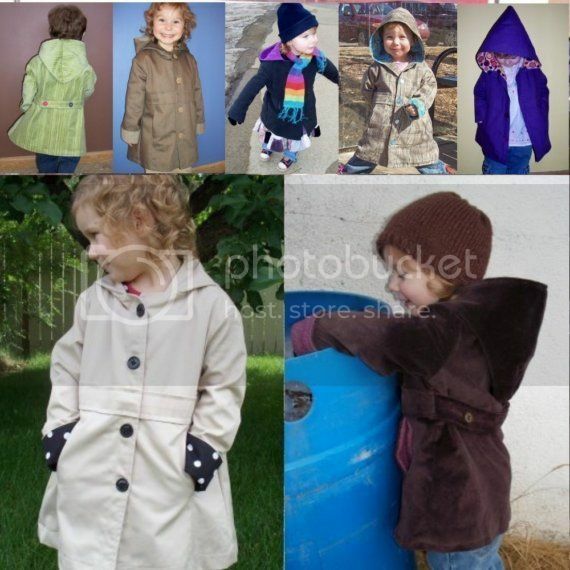 I would LOVE to win a copy of your big girl coat! I can picture my daughter in it already... super cute!!! I'm a little late for the contest, but thought I'd add that I love this too! I have been looking for a pattern to make my little B a peacoat(ish). My grandmother gave me a beautiful old velvet skirt she found deep in the back of her closet. She suggested some kind of romper, but I saw something else. Hopefully there is enough fabric. Thank you!